In this behind-the-scenes piece on Uncharted 3, we get a look at how actor Nolan North literally becomes series hero Nathan Drake. An in-depth feature on the PlayStation Blog is going into the process of motion-capturing the game's actors, revealing just how much work - and equipment - it takes to turn a man jumping around in a black suit into a video game character. The short answer is: a lot of work. A slightly longer answer is it takes 86 cameras to get all the actor's movements to a level of detail sufficient for the game's needs. And an interesting, slightly unrelated answer is that actors like North don't just perform their own character's moves. "This might surprise some people, but we don't just play Drake and Sully" says North. 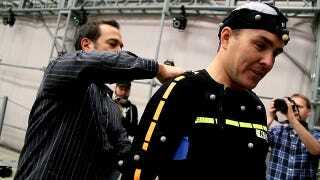 "Sometimes I'm mocapping the guy whose neck I'm breaking! Sometimes we play as the bad guys…in UNCHARTED 2's train sequence, you'll notice that one soldier runs with a bit of a limp. That's me, chasing me, and getting blown up by propane tanks."